Forget everything that you’ve learned so far on the Road to the 2019 Kentucky Derby. The 1 1/16-mile races don’t mean anything. The one-turn, 1-mile races mean even less. They can all be thrown to the side as we make our final turn into the stretch of the Derby trail and gear up for the all-important 1 1/8-mile races, starting this weekend with the Louisiana Derby (G2) and Sunland Derby (G3). I’m obviously being facetious. We’ve learned a great deal over the past six months about the potential runners that will fill the Derby gate, and seven horses have already accrued enough points (based on historical trends) to clinch a spot. There is definitely a lack of early burner speed! If the field make-up continues down the path of qualifying stalkers and closers like these first seven, then we may be in store for a slow to moderate pace in this year’s Derby. It is indeed still very early, though, and a lot can change in the last round of points races, where the first- and second-place horses will both qualify for the Derby due to them earning 100 and 40 points, respectively. To get an early sense of how the 2019 Kentucky Derby may unfold, let’s first take a look at the seven horses that have clinched a spot in the gate in Part 1 of the 2019 Kentucky Derby Early Pace Projection. In Part 2 (coming soon), we’ll pick apart the final round of preps to see who may bring the early gas to the Derby. Fast opening fractions. Pace meltdowns. Mid-pack stalkers and closers making big moves late in the stretch to nab coveted points. 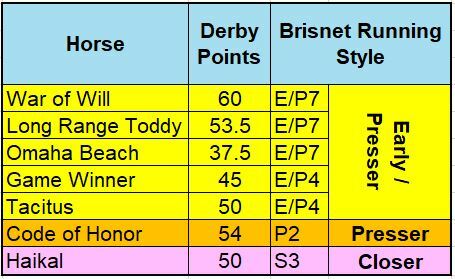 Based on the Brisnet running styles, even though three of the top seven have displayed an early speed rating of 7 (out of a possible maximum 8), none are true “need the lead” types. The overall points leader War of Will (who is favored to win Saturday’s Louisiana Derby) is content to sit off of the early pace and pounce when needed, as he did when winning both the LeComte Stakes (G3) and the Risen Star Stakes (G2). His tactical speed will be a tremendous weapon in the Kentucky Derby, as four of the past six winners entered the race displaying the E/P running style with a speed rating of 7 points. Long Range Toddy and Omaha Beach were also E/P7 types entering the two divisions of the Rebel Stakes (G2) last Saturday. Both burst from the gate first but then geared back and let a pacesetter get in front. Omaha Beach was more keen to press early, taking over into the far turn before holding off the Breeders’ Cup Juvenile (G1) champion Game Winner by a short nose in the Rebel’s second division. Long Range Toddy let the speed clear in front of him before jockey Jon Court made a huge move in the stretch to nab Grade 1 winner Improbable late to win the first division. In both cases, neither needed the lead. Per the Derby Trail Tracker, trainer Steve Asmussen is targeting the Arkansas Derby (G1) on April 13 for Long Range Toddy. Trainer Richard Mandella has said that Omaha Beach will target either the Arkansas Derby or the Santa Anita Derby (G1) a week earlier. Going further down the list of seven, Game Winner entered the Rebel with an E/P4 rating. He has never led at the first call in his five-race career. He doesn’t mind being 4 or 5 lengths off the early pace, like he did in the Breeders’ Cup Juvenile and the Rebel. It’s his preferred running style. 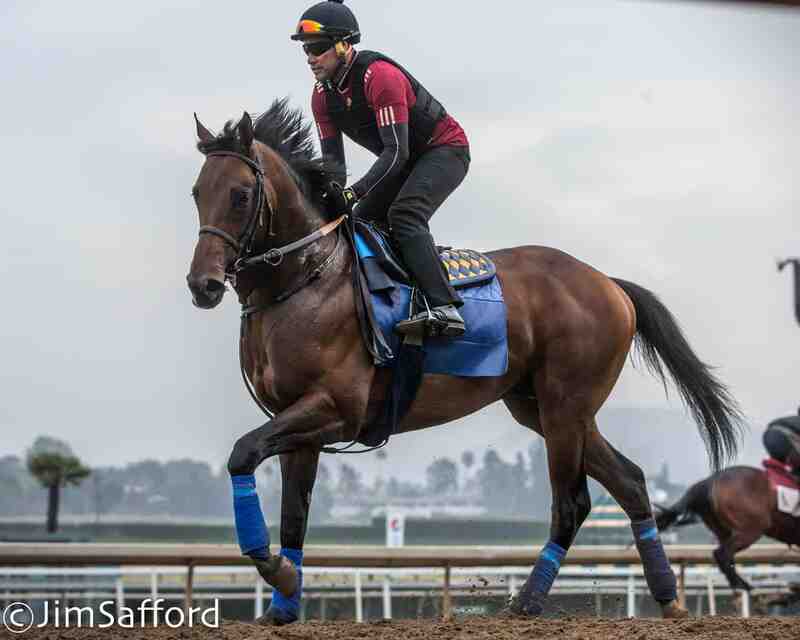 Trainer Bob Baffert is pointing Game Winner to the Santa Anita Derby on April 6. Just like Game Winner, Tacitus is also an E/P4 after his Tampa Bay Derby (G2) win, where he was 10 lengths from the lead at the first call. While Zenden caught a flier from the gate and blazed early, Tacitus sat a cozy mid-pack trip and slipped up the rail in deep stretch to stamp his spot in the Run for the Roses. Trainer Bill Mott is pointing the son of Tapit to the Wood Memorial (G2) at Aqueduct on April 6. The week before that, Code of Honor will run in the Florida Derby (G1) on March 30 for trainer Shug McGaughey. Even though Code of Honor went gate-to-wire to take his debut while sprinting at Saratoga last August, he has since resorted to an off-the-pace style, beginning when he stumbled out of the gate in the Champagne Stakes (G1). A few weeks ago in the Fountain of Youth Stakes (G2), Code of Honor was the beneficiary of a hot pace and made a mid-pack move to charge home late for the win. This was due in part to the favored Hidden Scroll setting suicidal fractions while being pressed by the 132/1 longshot Gladiator King. The final horse to clinch a spot, Haikal, is a stone-cold closer and should have no bearing on the early pace of his next race, likely the Wood Memorial. Haikal closed from the clouds to win the Gotham Stakes (G3) a couple of weeks ago for trainer Kiaran McLaughlin. Like Code of Honor, Haikal benefited from sprinter Much Better‘s hot early fractions. With seven stalker/closer types already in the Derby gate (barring any injuries or setbacks), where does that leave us in the overall Kentucky Derby pace picture? In the two fastest Derbies of the current points era, need-the-lead types with E8 styles clinched spots while going gate-to-wire in the 1 1/16-mile races. Danzing Candy (2016) and Promises Fulfilled (2018) were true need-the-lead types who won the San Felipe Stakes (G2) and the Fountain of Youth, respectively, and heated up the early fractions of their respective Kentucky Derby runs. 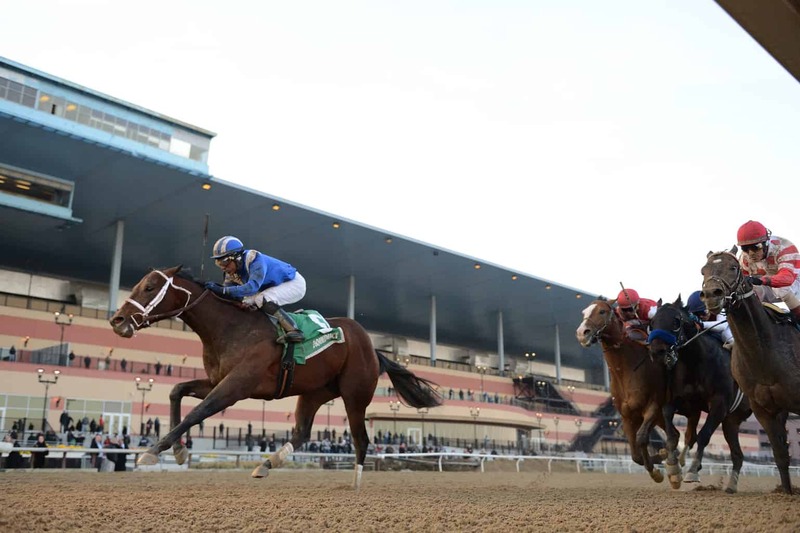 The horses that set the fast paces in this year’s 1 1/16-mile races were unable to hold on and earn the points necessary to clinch a spot in the Derby. Some of the fastest pacesetters, like Much Better and Zenden, may not even continue down the Derby path, so where will the speed come from? We’ll answer that question in Part 2 of the 2019 Kentucky Derby Early Pace Projection. Keep checking the Derby Trail Tracker for constant, daily updates as the final round of prep races near. Follow me on Twitter @SaratogaSlim for all of my Derby thoughts and ramblings. “Like Code of Honor, Haikal benefited from sprinter Much Better‘s hot early fractions in the one-turn configuration.” Nope. Code of Honor won a 2 turn. What are you on about? thats possibly the dumbest sentence recorded in 2019 Derby trail history so far.